Hello and welcome to Cyclingnews' live coverage of stage 7 of the 2016 Giro d'Italia. It's a 211km trip from Salmon to Foligno today in what could well come down to a bunch sprint. Hello, good morning, and welcome to Cyclingnews' live coverage of stage 7 of the Giro d'Italia. After the GC action yesterday, today we have a 211km stage from Salmon to Foligno that could well come down to a bunch sprint. The last of the riders are currently signing on and making their way to the start line, so we'll be underway shortly. As you can see, it's a tricky start with an early second-category climb, and there is rolling terrain thereafter, though nothing unduly difficult. The key test will be the late fourth-cat climb and gentle downhill in to the finish. The sprinters teams will be looking to keep things firmly under control but we could see some opportunistic attacks. And they're off. The riders have rolled out of Sulmona and, in contrast to yesterday, the sun is shining. 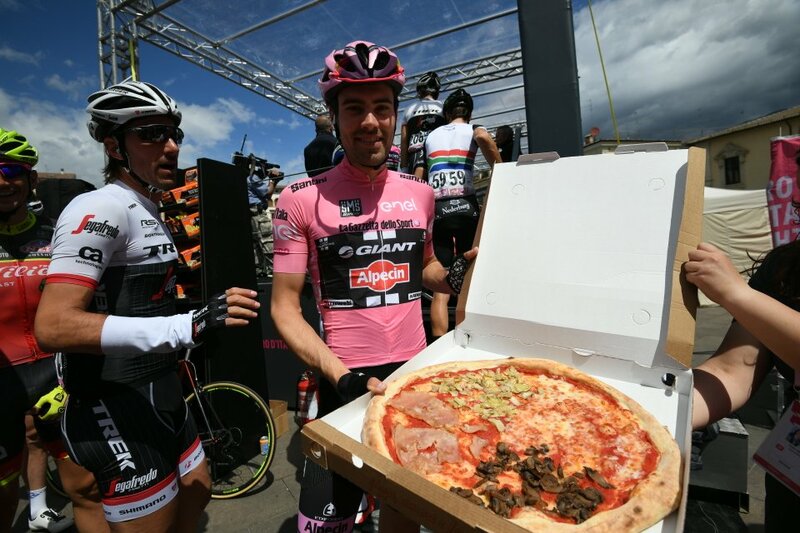 Race leader Tom Dumoulin received a pizza as he went to sign on. Unclear if he ate it there and then or folded it up and stuffed it into his jersey. We have some early attacks and it looks like a small group has gone up the road. Nippo Vini Fantini, the Italian Pro Conti team for whom it is a major objective in this race to be present in the breaks, are pulling on the front of the peloton, so have clearly not made it in. The three riders who have opened up a gap are Patrick Grestch (Ag2r-La Mondiale), Stefan Küng (BMC) and Jay McCarthy (Tinkoff). Cristian Rodriguez was also part of that move initially but has since dropped back. Nippo still chasing, and the escapees have a lead of around 30 seconds as it stands. The riders are on the early cat-2 climb of Le Svolte Di Popoli and the break have extended their lead towards the minute-mark. Nippo, of course, are also defending the mountains classification jersey of Damiano Cunego. If they could have kept things together it would have been a good opportunity for the Italian to pick up more KOM points. The pace is high in the bunch on this climb. Some riders are already being dropped, and the gap to the break is coming down. Cunego attacks, in search of KOM points. Everything has broken up on that climb to a greater extent than we had anticipated. The main group is down to about 40 riders, with several small groups on the road, and the break's advantage is slim. I think Tim Wellens, who pipped Cunego to fourth over that climb, could have taken the KOM jersey off the Italian in the process. Wellens, of course, scored big by winning yesterday's stage on the second-category summit finish. Here are the three early breakaway men, but it looks like they're about to be caught. #Giro The three leaders still have a small gap after the first climb. @Tim_Wellens was 4th on the climb and is now provisional KOM leader!! Our man Barry Ryan paid a visit to the Giant-Alpecin team bus this morning, and found the unusual sight of Nikias Arndt, Albert Timmer, and Tom Stamsnijder warming up ahead of the stage. They were planning to work hard in the early part of the stage and it's paying off as race leader Tom Dumoulin is safely in the front group at the moment. Stamsnijder was hopeful that Lotto Soudal and Etixx-QuickStep would help control things, but warned that it would be a complicated day: "It's a finish for sprinters but it's not an easy sprint stage." So, the break has been caught, and there is a front group of around 50 riders, which includes Dumoulin. We might have expected things to calm down and come back together in the aftermath of the climb but the pace is still high and there is a group containing the main sprinters which is 1:30 in arrears. Groups in between, too. The riders hit the 38-kilometre mark after one hour of racing. This race is simply not settling down. More moves going off the front of the bunch. The rain has stopped for now. We're still awaiting confirmation of who's in the group at the back, but we know that Marcel Kittel, and probably many other sprinters, are there. They find themselves 2 minutes behind now, and this is looking like a really complicated affair now for the fast men. The second and third groups on the road have now merged, so we have one large chase group over two minutes down on the leading group of 50. Dumoulin, along with all the main GC favourites are up at the head of the race. Kung, who was in the early breakaway trio, goes on the offensive once more, attacking off the front of the lead group. Foligno has hosted two Giro stage finishes in the past. The last one was two years ago, also on stage 7 curiously enough, and it was Nacer Bouhanni who took the spoils. It's not looking so sure for the sprinters today. Kung has made this attack work for now, and has around half a minute on the pink jersey group. Chase group still trying to come back - we'll get a time check for you shortly. More moves off the front of the bunch now as Axel Domont (Ag2r), Giolui Ciccone (Bardiani-CSF), Stefan Denifl (IAM), Ilya Koshevoy (Lampre-Merida) and Daniel Martinez (Wilier-Triestina-Southeast) set off in pursuit of Kung. Those five riders make the bridge, and the peloton are happy to let a proper breakaway form and duly ease up. Six riders out front, then. Ciccone picked up maximum points at the intermediate sprint in L'Aquila, followed by Denifl and Kung. Riders who were previously dropped are coming back up to the pink jersey, and the race looks to be settling back into a more normal format. So, breakaway and a peloton. That wasn't hard, was it?! 90 kilometres covered in the race and the riders are heading downhill towards the feed zone at Terme di Cotilia. It's dry out there for now. The situation is stable with the breakaway men enjoying a three-minute buffer over the peloton. The polemics continue in Italy after Nibali's failed attack during yesterday's stage. “There’s not much to clear up but we did speak after the stage,” Nibali confirmed before the start today. The finish in Foligno is suited to a sprint finish but it will be interesting to see the effects of the aggressive racing will impact the finish. The 211km stage is very similar to the one of 2014, when Nacer Bouhanni won the sprint, beating Giacomo Nizzolo and Luka Mezgec. The six attackers still lead by 3:05. Astana DS Beppe Martinelli was also questioned about the tactical mistakes of yesterday. He played down a suggestion that Nibali made a mistake by blaming his team car for ordering him to attack. “Is there a problem? How many times does a football coach make a tactical decision during a match without any problems. If Vincenzo had closed the gap it’d have been a perfect tactic, he didn’t do it… so we made a mistake,” Martinelli said. To read more about Astana's tactics, click here to see what Paolo Bettini said. He suggested that "Letting Dumoulin gain seconds is like playing with fire"
The riders are currently passing through the feed zone, taking their musettes to enjoy their lunch at the mid-way point in the stage. After rain during yesterday's stage, the weather is better today and improving all the time. The roads are damp in the race but the sun is out at the finish. The early climbs of the stage caused some aggressive racing and splits in the peloton. At one point the peloton was split into three groups with 50 riders up front. Things have since calmed down but it will be interesting to see who will chase the break today. Weather forecasts predict more rain in the days to come, especially for Saturday's dirt road section before Arezzo and then during Sunday's 40km Chianti time trial. Kung is riding aggressively today in the break. He has a tough relationship with the Giro. He crashed out last year and crashed during the opening time trial in Apeldoorn, after setting a fast intermediate time. Behind Lotto Soudal and FDJ are leading the chase for Greipel and Demare respectively. The riders are now on the valley road after Rieti. They will soon drop down to Terni and then face the final climb of the day: the Valico della somma. After the steady climb it will be a downhill run virtually on the road to Foligno. Valerio Agnoli is riding i support of Vincenzo Nibali at the Giro d'Italia but is also celebrating fatherhood today after his partner gave birth to a baby boy. According to reports they have opted to call him Luis Leon. Situation / Situazione Break / Fuga: @stefankueng@domontaxel@stefandenifl@giuliocicco1@il_koshevoy@daniel_danielma ⌚ 3'00"
Crash. There's a Movistar rider down on the ground and this does not look good. It's Javi Moreno and there are two doctors and one Movistar staff member tending to him as he lies flat on the ground. He's conscious and moving, but he has obviously taken a huge knock there. Doctors are holding Moreno's neck in place and the rider points to his shoulder. Is this a collarbone injury? What's certain is that his Giro is over, and he's being put into an ambulance on a stretcher. While Moreno heads to hospital, the race goes on, and Alejandro Valverde has lost a key support rider. We'll bring you an update on Moreno's condition as soon as we know more. We have confirmation that Moreno has fractured his collarbone. The race doctor tending to the Spaniard was certain of it, and told the moto cameraman. Meanwhile, back in the race, we're approaching the 70km-to-go mark and the breakaway riders have a lead of three minutes. FDJ currently lead the peloton, working for Arnaud Demare, who has finished second on two occasions so far at this Giro. Behind the white and blue jerseys are Lotto Soudal, looking to set Greipel up for a second stage win. Then it's Giant-Alpecin, keeping Dumoulin safe and sound. We've just come through Marmore, with riders within reach of the spray coming off a huge, 165-metre manmade waterfall. FDJ and Lotto continue to drive this. No sign of Etixx-QuickStep at this point - they'll just want Marcel Kittel to get over this upcoming climb before they think about working for the finale. It won't be long before the riders hit the bottom of this cat-4 climb, so here's a reminder of the stage profile. As the riders make their way up the lower slopes of the climb, the pac in the bunch has caused the breakaway's lead to come down to under the 2-minute mark. Lotto and FDJ still at the front, GC teams not far behind. It's a steady pace at the moment, no attacks and no real pressure being applied at the moment. 1:20 is the gap now. The sprinters' teams will be happy to keep this steady now. They'll want to keep this break dangling out there so that the race doesn't come back together and encourage further attacks. Attack. Damiano Cunego goes, taking a Nippo teammate with him. The Italian wants to pick up the final KOM points on offer at the top of this climb. Tim Wellens moved ahead of him on the provisional standings earlier today on the second-category climb, so Cunego wants to make sure he stays in the blue jersey tomorrow. Cunego has 30 seconds, while Dimension Data hit the front of the bunch. With six men in the break, Cunego has to get over to the break to have any chance of getting a KOM point. We're nearing the summit and he hasn't made it, so it's not looking good for the Italian. Martinez takes maximum points at the top of the climb. Ciccone was the only other rider to really test him but it was comfortable for the Colombian. Cunego comes over 40 seconds later. He has now lost the KOM jersey which will pass over to Tim Wellens at the end of the stage. The peloton splits slightly as the riders come over the top of the climb and Kittel is caught several seconds behind. He shouldn't have any issue, however, regaining contact. That was the headline in yesterday's Gazzetta dello Sport, with three riders who were supposed to be here for Sky, Leopold Konig, Benat Intxausti, and Sergio Henao, all absent. We have an update on Konig, who has a knee injury and should be back to racing in June. As the gap continues to come down, Kung takes off on this descent and goes solo. Kittel isn't back on yet. He finds himself 20 seconds down on the pink jersey group. Matteo Trentin comes to the front of the bunch to try and knock off the pace with his leader Kittel caught behind. Cannondale, though, are keen to drive this one on. Kung has his arms tucked over his bars as he uses his endurance track caliber to stay clear. He has just under a minute, while the rest of the break has been caught by the bunch. Cannondale are really going for it here. They don't have a sprinter in the top tier at this race, but they have been seen working on the flat stages. The peloton resembles one big single file line as the pace stays high. It's Ramunas Navardauskas drilling it on the front of the bunch and the pace means that Kung's lead is coming down fast. The BMC man now has under half a minute. Puncture for Pippo Pozzato, so he'll probably just have to roll home now. Here's a look at the finale of today's stage. Three 90-degree bends around the flamme rouge make this a technical, and potentially messy one. The rain is holding off at the moment though. The peloton bunches back up as they come under the 15km to go banner. Time for the sprinters' teams to start to push for position. The peloton strings out once more as they bring Kung into sight. IAM Cycling take it up now. Kung's doing a remarkable job of keeping himself out there as long as possible. It's a futile effort but he still has just under 10 seconds. Kung is caught. Now it's all about the sprint trains. Adam Hansen gets out of the saddle and really drives things on for Lotto Soudal. The Belgian team has lots of men up there, and so do IAM. It's not clear at the moment whether IAM will be leading out Pelucchi or Howard. Fabian Cancellara, who was ill at the start of this Giro, forces his way up through the bunch, dragging Nizzolo with him. Marcel Kittel is out of the picture! The German is forced to dismount. It's unclear if it was a crash or a mechanical but what's certain is that he will not be contesting today's sprint. Big blow for the red jersey. The pace is so high right now. It can't be overstated how important positioning will be in this technical finale. Hansen still smashing it on the front and riders are getting shelled out of the back. Last 3km. Lotto with three men on the front, and is Greipel now the hot favourite? Lampre move up now. Nozzle's Trek well positioned. Demare has one teammate. LottoNL now move to the front, working for Moreno Holland. Lotto Soudal now down to two men. Roelandts it is now the last man for Greipel. Lampre lead under the flamme rouge. Headwind. Herre we go. Rolland's leading out for Greipel. 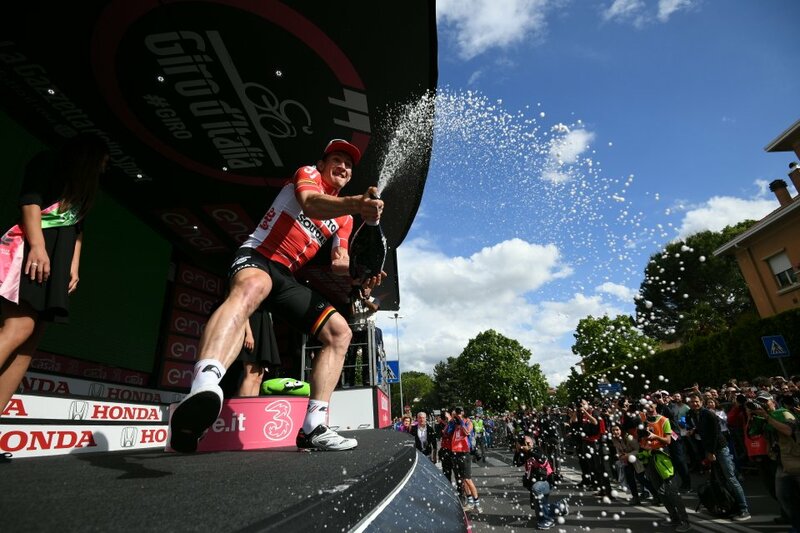 Ewan was fading on the right, Modolo was coming up on the left, but Greipel punched his way through the middle to take his second victory of this Giro. 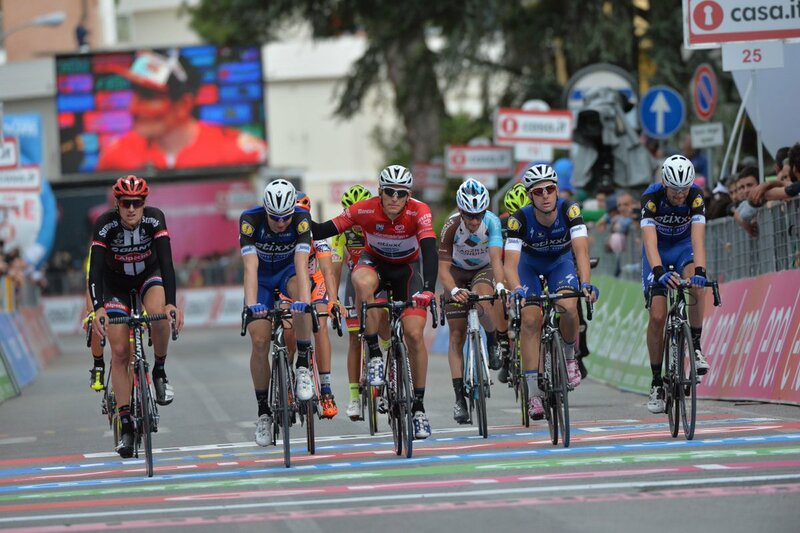 Nizzolo took second in the end there, as he was when the stage finished here in 2014. Greipel let Orica come to the front and lost a few places. He then moved over to the wheel of Sacha Modolo and produced an utterly convincing and well-timed final sprint to come through. Going by those results it seems Esteban Chaves has dropped out of the top 10 overall. We're not sure why. It could be an error from the race in computing the numbers and finishing times. We'll let you know soon. Confirmed that Esteban Chaves lost nine seconds. "It was a pretty hard day, especially at the beginning" says race leader Tom Dumoulin. "Nippo missed the break - like every day - so they then chased it down again. It was really hard and very uncontrollable. After that there was a good break up the road and it was more controllable." "I was looking for a wheel to follow, I thought it was going to be too late but luckily I found a way through. I still had good power left so I was looking for a gap and Modolo stayed on his line so I found the gap and launched my sprint," Greipel tells Eurosport. The German punctured with 5km remaining, meaning the two-time stage winner couldn't contend the sprint. Before that he was dropped on a climb and had to chase back on. Not a good day at the office, but it's already been a highly successful Giro for the 27-year-old. To compound Greipel's joy and Kittel's woe, the Lotto Soudal man has taken the red points jersey off his compatriot and rival. Here's Tim Wellens, who moved into the lead of the mountains classification today. “When the escape was gone with three leaders, we thought the breakaway was gone but then the team of Cunego started to ride. I just followed Cunego and passed him before the line. It was not really my plan to take points. “The plan was to help Andre as much as possible. In the final I did a little bit of work for him, and I am very happy that he won. We've been wrapping up rider reactions and you can find them here in today's edition of finish line quotes. So, onto tomorrow, and we have a tricky stage in store - 186km from Foligno to Arezzo, where a late second-category climb and fast run down to the finish is sure to shake things up. We hope you'll join us once again for full live coverage. That's it from us. Thanks for joining us today, we'll have all the latest news and reaction from the race in the coming hours, so make sure you keep an eye on Cyclingnews. Bye!